In most parts of the world, tobacco is used for smoking, whereas, in India, tobacco is used for smoking as well as in diverse smokeless forms. Absorption of toxic and carcinogenic chemicals in tobacco and other ingredients added to various products are causally associated with several non-communicable diseases including cancer, especially oral cancer, which is the leading cancer among men and the third most common cancer among women in India. This article highlights the toxicity, mutagenecity and carcinogenic effects of hazardous chemicals present in smokeless tobacco products. This endeavor was based on the extensive review of literature from various sources. The SLT products have influence on cellular metabolism, ability to cause DNA damage, and cancer in experimental animals. It is, therefore, essential to consider the collective role of chemical constituents of SLT products in the causation of adverse effect on human health. In India tobacco is used mainly for smoking and oral use while nasal use is relatively infrequent. The term, smokeless tobacco (SLT) is used to describe tobacco that is not burned before or at the time of use as opposed to cigarettes or bidis that are burned to liberate smoke. SLT products range in complexity from tobacco-only, to products containing numerous chemical ingredients and additives. ,, This article deals specifically with the chemistry and toxic effects of smokeless tobacco products. SLT products contain a number of toxic, mutagenic or carcinogenic chemicals that can contribute to the onset of non-communicable diseases including cancer, heart disease, diabetes, and other oral pathologies. As a prelude to the chemistry and toxic products in SLT an overview of some common SLT products are given below. Smokeless tobacco products can be grouped into those used for chewing, sucking, gargling, sniffing, and as dentifrice. Some products are commercially available or a user can prepare the desired product from ingredients. Orally used products are chewed and placed in the space between the lower lip and gums or in the space between the gums and the cheek. Khaini prepared from sun-dried tobacco and slaked lime is commonly used in the states of Gujarat and Maharashtra. Gudakhu or gul is a paste prepared from powdered tobacco and molasses. It is applied to the gums and teeth with a finger. Masheri, also called mishri, is made at home by roasting tobacco flakes on a hot griddle until it turns brown or black. It is applied to gums and teeth and retained in the mouth for variable time period. Bajjar (dry snuff) is another tobacco product used mainly by women for cleaning teeth and gums. Lal dantamanjan (red tooth powder) is a commercially available tooth powder, while creamy snuff is a tobacco-containing tooth paste. Tuibur is actually water through which tobacco smoke is passed. The water containing chemicals present in tobacco smoke is used for sipping or gargling in the northeastern states of India. Nasal snuff is finely ground flavored tobacco that is placed in the nostrils and sniffed. Bidi tobacco is prepared from sun-dried Nicotiana tabacum leaves which are manually shredded, pounded and sieved to obtain flakes of desired size. In the work situation, bidi tobacco dust and volatile compounds are inhaled by tobacco processors and bidi rollers, inadvertently. These workers also absorb tobacco constituents via the cutaneous route. Tobacco used for bidi manufacture is also chewed by the workers. Hence available information on bidi tobacco is included here. Arecoline, the major alkaloid in areca nut, has been found to stimulate collagen synthesis in fibroblasts;  whereas, catechin, flavonoid, and tannin compounds in areca nut cross-linked collagen fibers making them less susceptible to collagenase degradation. It has also been suggested that copper upregulates lysyl oxidase, leading to excessive cross-linking and accumulation of collagen in patients with oral submucous fibrosis (OSF). In a study of seven Indian SLT products, high level of copper were detected in four gutka products as compared to zarda, creamy snuff, and khaini, which do not contain areca nut. Jacob et al.,  demonstrated a definitive dose-dependent relationship between the frequency and duration of chewing areca nut without tobacco and the development of OSF in users. Slaked lime is composed of calcium hydroxide and is obtained from lime stone or sea shells. In addition, it also contains iron, magnesium, and a number of trace elements. , The addition of slaked lime and other alkaline agents like magnesium carbonate  boost the pH of a product and results in increased availability of free nicotine, the form that is most easily absorbed. Carcinogenic compounds in SLT include polycyclic aromatic hydrocarbons, lactones, coumarin, ethyl carbamate, some volatile aldehydes, volatile N-nitrosamines, nitrosamino acids, tobacco specific N-nitrosamines, inorganic compounds, radioactive Polonium 210, and Uranium 235 and 238. N-Nitrosonornicotine (NNN), 4-(methylnitrosamino)-1 (3-pyridyl)-1 butanone (NNK), and N-nitrosamino acids are quantitatively the most prevalent strong carcinogens in SLT. 4-[Methylnitrosamino]-1-[3-pyridyl] 1-butanol) (NNAL) is also carcinogenic, while NAB (N9-nitrosoanabasine) is a moderately potent carcinogen and N-nitrosoanatabine (NAT) is generally considered inactive. Both NNK and NNN have been classified by the IARC as carcinogenic to humans (Group 1). Carcinogenic tobacco specific N-nitrosamines are formed by nitrosation of tobacco alkaloids. Hence, nitrate and nitrite levels in SLT assume importance. Preformed NNK, NNN, and NAT were detected in chewing tobacco sold under brand name Lanka. High levels of NNK, NNN, NAB, and NAT were reported in zarda and khaini and TSNA level in gutka was higher than the permissible limits in food. , [Table 1] from Stepanov et al. 2005). Specific exposure to toxicants is demonstrated by their presence in the body fluids of exposed individuals, while elevated levels of xenobiotic detoxification products and detoxifying enzymes denote response to toxic agents in general. Presence of nicotine or its metabolite cotinine or tobacco specific nitosamines in body fluids denote specific exposure to tobacco. Elevated urinary thiothers and glucuronide levels indicate non-specific exposure to toxicants, while demonstration of urinary mutagenicity denotes an individual's exposure to mutagens. Micronucleus assay detects genotoxic effect of exposure to hazardous agents resulting in the formation of small membrane bound DNA fragments or micronuclei in the cytoplasm of interphase cells. A high proportion of tobacco processors with no tobacco habit and those with masheri habit exhibited a significantly elevated frequency of chromatid breaks and deletion fragments as compared to respective controls. SCE frequency was also elevated in the lymphocytes of habit-free tobacco processors. A significant increase in the frequency of chromosomal aberrations was observed in PBL from tobacco processors with or without smoking habits  with the frequency of chromosomal aberrations increasing with the number of years of exposure. In India, where tobacco use includes, not only smoking, but also the use of a variety of SLT products, users of SLT are exposed to a number of toxicants, carcinogens, co-carcinogens, and tumor promoters, SLT use is causally associated with high incidence of oral cancer in India. Another aspect is occupational tobacco exposure of millions of workers in bidi industry. NNN and NNK in SLT and areca nut, the major ingredient of many SLT products, are classified as definite human carcinogens by the IARC. Hence, it should be mandatory to list the contents of nicotine, TSNA and areca nut on every commercial SLT product, along with their cancer causing properties. Product labels should also display the metal contents and their known associations with diseases, e.g., of copper, and its association with oral submucous fibrosis. Such information along with strong health warnings, will highlight potential dangers of SLT use. Along with strong health warnings. Additionally, acceptable limits of heavy metals in SLT products should be determined and enforced. A battery of biomarkers with strong association for cancer risk needs to be established in large population studies for early detection of individuals with very high cancer risk. Every tobacco processing factory should be mechanized and dust filters fitted into the factories to reduce tobacco dust exposure to workers. Finally, all efforts are needed to reduce the harmful agents present in SLT products. 1. Scientific Committee on Emerging and Newly Identified Health Risks (SCENIHR). Opinion on: Health Effects of Smokeless Tobacco Products, 2008. Available from: http://www.ec.europa.eu/health/ph_risk/committees/09_scenihr/scenihr_opinions_en.htm#5. [Last accessed on 2012 Dec 20]. 2. IARC Monographs on the Evaluation of Carcinogenic Risks to Humans, Vol. 85. Betel-quid and Areca-nut Chewing and Some Tobacco specific N-Nitrosamines. Lyon, France: IARC; 2004. Available from: monographs.iarc.fr/ENG/Monographs/vol85/volume85.pdf. [Last accessed on 2012 Dec 20]. 4. Reddy KS, Gupta PC. Report on Tobacco Control in India, Ministry of Health and Family Welfare, Government of India, New Delhi; 2004. 5. Gupta PC, Ray CS. Smokeless tobacco and health in India and South Asia. Respirology 2003;8:419-31. 6. Bagwe AN, Bhisey RA. Occupational exposure to tobacco and resultant genotoxicity in bidi industry workers. Mutat Res 1993;299:103-9. 7. Raghavan V, Baruah HK. Arecanut: India′s popular masticatory-History, chemistry and utilization. Econ Bot 1958;12:315-25. 8. Shivashankar S, Dhanaraj S, Mathew AG, Srinivasa S, Vyasamurthy MN, Govindarajan VS. Physical and chemical characteristics of processed areca nuts. J Food Sci Technol 1969;41:113-6. 9. Arjungi KN. Areca nut: a review. Arzneimittelforschung (Drug Res) 1976;26:951-7. 10. Huang JL, McLeish MJ. High-performance liquid chromatographic determination of the alkaloids in betel nut. J Chromatogr A 1989;475:447-50. 11. Lord GA, Lim CK, Warnakulasuriya S, Peters TJ. Chemical and analytical aspects of areca nut. Addict Biol 2002;7:99-102. 12. Ridge C, Okanale O, Spyrou, N. Elemental composition of betel nut and associated chewing materials. J Radioanal Nucl Chem 2001;249:67-70. 13. Canniff JP, Harvey W. The aetiology of oral submucous fibrosis: The stimulation of collagen synthesis by extract of areca nut. Int J Oral Surg 1981;10:163-7. 14. Harvey W, Scutt A, Meghji S, Canniff JP. Stimulation of human buccal mucosa fibroblasts in vitro by betel-nut alkaloids. Arch Oral Biol 1986;31:45-9. 15. Trivedy C, Baldwin D, Warnakulasuriya S, Johnson N, Peters T. Copper content in Areca catechu (betel nut) products and oral submucous fibrosis. Lancet 1997;349:1447. 16. Dhaware D, Deshpande A, Khandekar RN, Chowgule R. Determination of toxic metals in Indian smokeless tobacco products. Scientific World Journal 2009;9:1140-7. 17. Jacob BJ, Straif K, Thomas G, Ramadas K, Mathew B, Zhang ZF, et al. Betel quid without tobacco as a risk factor for oral precancers. Oral Oncol 2004;40:697-704. 18. Wang CK, Wu MJ. The separation of phenolics from Piper betle leaf and the effect on the mutagenicity of arecoline. J Chin Agric Chem Soc 1996;34:638-47. 19. Zaidi JH, Arif M, Fatima I, Qureshi IH. Radiochemical neutron activation analysis for trace elements of basic ingredients of pan. J Radioanal Nucl Chem 2002;253:459-64. 20. Nair UJ, Friesen M, Richard I, MacLennan R, Thomas S, Bartsch H. Effect of lime composition on the formation of reactive oxygen species from areca nut extract in vitro. Carcinogenesis 1990;11:2145-8. 21. Gupta P. Laboratory Testing of Smokeless Tobacco Products: Final Report to the India Office of the WHO (Allotment No. : SE IND TOB 001.RB.02), New Delhi; 2004. Cited in IARC Monograph 89; 2007. 22. Stepanov I, Hecht SS, Ramakrishnan S, Gupta PC. Tobacco-specific nitrosamines in smokeless tobacco products marketed in India. Int J Cancer 2005;116:16-9. 23. Rodgman A, Perfetti TA. The chemical components of tobacco and tobacco smoke. CRC Press; Boca Raton; 2009. p. 1784. 24. Burton HR, Bush LP, Hamilton JL. Effect of curing on the chemical composition of burley tobacco. Recent Adv Tob Sci 1983;9:91-153. 25. Burton HR, Bush LP, Djordjevic MV. Influence of temperature and humidity on the accumulation of tobacco-specific nitrosamines in stored burley tobacco. J Agric Food Chem 1989;37:1372-7. 26. Burton HR, Childs GH Jr, Andersen RA, Fleming PD. Changes in chemical composition of burley tobacco during senescence and curing 3. Tobacco-specific nitrosamines. J Agric Food Chem 1989;37:426-30. 27. Peele DM, Riddick MG, Edwards ME. Formation of tobacco-specific nitrosamines in flue-cured tobacco. Recent Adv Tob Sci 2001;27:3-12. 28. Bush LP, Cui M, Shi H, Burton HR, Fannin FF, Lei L, et al. Formation of tobacco-specific nitrosamines in air-cured tobacco. Recent Adv Tob Sci 2001;27:23-46. 29. Tso TC. Production, Physiology, and Biochemistry of Tobacco Plant. Ideals: Beltsville, MD; 1990. p. 55-64, 431, 595-614. 30. Brunnemann KD, Hoffmann D. Chemical composition of smokeless tobacco products. In: Smokeless Tobacco or Health. An International Perspective (Smoking and Tobacco Control Monograph No. 2; NIH Publ. No. 93-3461) Bethesda, MD. National Cancer Institute; 1992. 31. IARC monographs on the evaluation of the carcinogenic risk of chemicals to humans. Vol. 37. Tobacco habits other than smoking; betel quid and areca-nut chewing; and some related nitrosamines. Lyon: International Agency for Research on Cancer; 1985. 32. Armitage AK, Turner DM. Absorption of nicotine in cigarette and cigar smoke through the oral mucosa. Nature 1970;226:1231-2. 33. Tomar SL, Henningfield JE. Review of the evidence that pH is a determinant of nicotine dosage from oral use of smokeless tobacco. Tob Control 1997;6:219-25. 34. Hoffmann D, Rivenson A, Amin S, Hecht SS. Dose-response study of the carcinogenicity of tobacco-specific N-nitrosamines in F344 rats. J Cancer Res Clin Oncol 1984;108:81-6. 35. Bhide SV, Nair J, Maru GB, Nair UJ, Kameshwar Rao BV, Chakraborty MK, et al. Tobacco-specific N-nitrosamines [TNSA] in green mature and processed tobacco leaves from India. Beit Tabakforsch 1987;14:29-32. 36. Nair J, Ohshima H, Friesen M, Croisy A, Bhide SV, Bartsch H. Tobacco-specific and betel nut-specific N-nitroso compounds: Occurrence in saliva and urine of betel quid chewers and formation in vitro by nitrosation of betel quid. Carcinogenesis 1985;6:295-303. 37. Nair UJ, Pakhale SS, Speigelhalder B, Preussmann R, Bhide SV. Carcinogenic and cocarcinogenic constituents of Masheri, a pyrolysed tobacco product. Indian J Biochem Biophys 1987;24:257-9. 38. Bhide SV, Murdia US, Nair J. Polycyclic aromatic hydrocarbon profiles of pyrolysed tobacco products commonly used in India. Cancer Lett 1984;24:89-94. 39. Nair UJ, Pakhale SS, Bhide SV. Carcinogenic tobacco-specific nitrosamines in Indian tobacco products. Food Chem Toxicol 1989;27:751-3. 40. Tricker AR, Preussmann R. The occurrence of N-nitro compounds in zarda tobacco. Cancer Lett 1988;42:113-8. 41. Pakhale SS, Dolas SS, Maru GB. Determination of alkaloids, nitrate, nitrite, moisture and pH in tobacco varieties from different parts of India. Tob Res 1997;23:11-8. 42. Roberts DL. Natural tobacco flavor. Recent Adv Tob Sci 1988;14:49-81. 43. Mookherjee JE, Wilson RA. Tobacco constituents-their importance in flavor and fragrance chemistry. Recent Adv Tob Sci 1988;14:114-68. 44. Sharma AK, Prokopczyk B, Hoffmann D. Supercritical fluid extraction of moist snuff. J Agric Food Chem 1991;39:508-10. 45. LaVoie EJ, Tucciarone P, Kagan M, Adams JD, Hoffmann D. Analyses of steam distillates and aqueous extracts of smokeless tobacco. J Agric Food Chem 1989;37:154-7. 46. Stanfill SB, Brown CR, Yan XJ, Watson CH, Ashley DL. Quantification of flavor-related compounds in the unburned contents of bidi and clove cigarettes. J Agric Food Chem 2006;54:8580-8. 47. Djordjevic MV, Hoffmann D, Glynn T, Connolly GN. 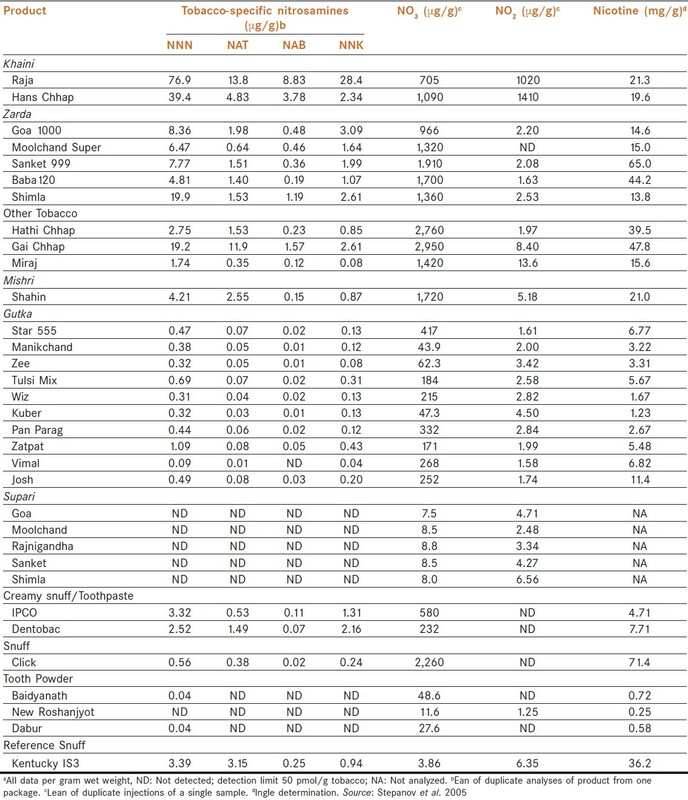 US commercial brands of moist snuff, 1994-assessment of nicotine, moisture, and pH. Tob Control 1995;4:62-6. 48. Wenke G, Brunnemann KD, Hoffmann D, Bhide SV. A study of betel quid carcinogenesis. IV. Analysis of the saliva of betel chewers: A preliminary report. J Cancer Res Clin Oncol 1984;108:110-3. 49. Bhide SV, Nair UJ, Nair J, Spiegelhalder B, Preussmann R. N-Nitrosamines in the saliva of tobacco chewers or masheri users. Food Chem Toxicol 1986;24:293-7. 50. Govekar RB, Bhisey RA. Mutagenic activity in urine samples from female tobacco habitués. Cancer Lett 1993;69:75-80. 51. Bagwe AN, Bhisey RA. Occupational exposure to unburnt bidi tobacco elevates mutagenic burden among tobacco processors. Carcinogenesis 1995;15:1095-9. 52. Niphadkar MP, Contractor QQ, Bhisey RA. Mutagenic activity of gastric fluid from chewers of tobacco with lime. Carcinogenesis 1994;15:927-31. 53. Bagwe AN, Buch SC, Mahimkar MB, Karthikeyan S Bhisey. RA: Environmental, biological and health monitoring of tobacco processing factory workers. Proceedings of World Assembly on Tobacco Counters Health-WATCH 2000; India: Macmillan Publishers; 2000. p. 160-3. 54. Bhisey RA, Govekar RB. Biological monitoring of bidi rollers with respect to genotoxic hazards of occupational tobacco exposure. Mutat Res 1991;261:139-47. 55. Govekar RB, Bhisey RA. Elevated urinary thioether excretion among bidi rollers exposed occupationally to processed tobacco. Int Arch Occup Environ Health 1992;64:101-4. 56. Mahimkar MB, Buch SC, Samant TA, Kapoor MD, Bhisey RA. Influence of smokeless tobacco exposure on detoxification status and chromosomal damage in male and female habitues. Mutat Res 2001;491:111-7. 57. Bhisey RA, Bagwe AN, Mahimkar MB, Buch SC. Biological monitoring of bidi industry workers occupationally exposed to tobacco. Toxicol Lett 1999;108:259-65. 58. Ammigan N, Nair UJ, Amonkar AJ, Bhide SV. Effect of tobacco extract and N -nitrosonornicotine on the carcinogen metabolising enzymes under different dietary vitamin B status. Cancer Lett 1990;52:153-9. 59. Bhide SV, Shah AS, Nair J, Nagarajrao D. Epidemiological and experimental studies on tobacco-related oral cancer in India. IARC Sci Publ 1984;57:851-7. 60. Shah MD, Ramchandani AG, Mahimkar MB, Potdar PD, Bhisey AN, Bhisey RA. Effect of an aqueous extract of processed bidi tobacco on the growth of hamster tracheal epithelial cells. Toxicol Lett 2001;119:1-9. 61. Bagwe AN, Ramchandani AG, Bhisey RA. Skin-tumour-promoting activity of processed bidi tobacco in hairless S/RV Cri-ba mice. J Cancer Res Clin Oncol 1994;120:485-9. 62. Niphadkar MP, Bagwe AN, Bhisey RA. Mutagenic potential of Indian tobacco products. Mutagenesis 1996;11:151-4. 63. Bhide SV, Kulkarni J, Nair UJ, Spiegelhalder B, Preussmann R. Mutagenicity and carcinogenicity of masheri, a pyrolysed tobacco product, and its content of tobacco-specific nitrosamines. IARC Sci Publ 1987;84:460-2. 64. Nair U, Obe G, Nair J, Maru GB, Bhide SV, Pieper R, et al. Evaluation of frequency of micronucleated oral mucosa cells as a marker for genotoxic damage in chewers of betel quid with or without tobacco. Mutat Res 1991;261:163-8. 65. Bhisey RA, Govekar RB, Bagwe AN, Mahimkar MB. Biological risk assessment in tobacco chewers: A population at high risk for oral cancer. In: Rao RS, Desai PB, editors. Oral Cancer. Bombay: Tata Memorial Centre Publishers; 1991. p. 191-9. 66. Ghose UR, Parida BB. Cytological study of exfoliated buccal mucosa cells of the tribes in Orissa State (India) with high risk of oral cancer. Indian J Cancer 1995;32:95-9. 67. Adhvaryu SG, Dave BJ, Trivedi AH. Cytogenetic surveillance of tobacco-areca nut (mava) chewers, including patients with oral cancers and premalignant conditions. Mutat Res 1991;261:41-9. 68. Das RK, Dash BC. Genotoxicity of ′gudakhu′, a tobacco preparation. II. In: Habitual users. Food Chem Toxicol 1992;30:1045-9. 69. Mahimkar MB, Samant TA, Kannan S, Patil T. Influence of genetic polymorphisms on frequency of micronucleated buccal epithelial cells in leukoplakia patients. Oral Oncol 2010;46:761-6. 70. Mahanta J, Chetia M, Hazarika NC, Narain K, Sharma SK. Toxicity of tuibur, a unique form of tobacco smoke extract in Mizoram, India. Curr Sci 1998;75:381-4. 71. Mahimkar MB, Bhisey RA. Occupational exposure to bidi tobacco increases chromosomal aberrations in tobacco processors. Mutat Res 1995;334:139-44. 72. Umadevi B, Swarna M, Padmavathi P, Jyothi A, Reddy PP. Cytogenetic effects in workers occupationally exposed to toabacco dust. Mutat Res 2003;535:147-54. 74. Ramchandani AG, d′Souza AV, Borges AM, Bhisey RA. Evaluation of the carcinogenic potential of gutkha and chewing tobacco using animal bioassay Proceedings of World Assembly on Tobacco Counters Health-WATCH 2000, India: Macmillan Publishers; 2000. p. 164-7. 75. Suri K, Goldman HM, Wells H. Carcinogenic effect of a dimethyl sulphoxide extract of betel nut on the mucosa of the hamster buccal pouch. Nature 1971;230:383-4. 76. Gijare PS, Rao VK, Bhide SV. Modulatory effects of snuff, retinoic acid and β-carotene on DMBA-induced hamster cheek pouch carcinogenesis in relation to keratin expression. Nutr Cancer 1990;14:253-9. 77. Kulkarni J, Lalitha VS, Bhide S. Weak carcinogenic effect of masheri, a pyrolysed tobacco product, in mouse skin tumor models. J Cancer Res Clin Oncol 1989;115:166-9. 78. Buch SC, Notani PN, Bhisey RA. Polymorphism at GSTM1, GSTM3 and GSTT1 gene loci and susceptibility to oral cancer in an Indian population. Carcinogenesis. 2002;23:803-7. 79. Anantharaman D, Chaubal PM, Kannan S, Bhisey RA, Mahimkar MB. Susceptibility to oral cancer by genetic polymorphisms at CYP1A1, GSTM1 and GSTT1 loci among Indians: Tobacco exposure as a risk modulator. Carcinogenesis 2007;28:1455-62. 80. Anantharaman D, Samant TA, Subrata S, Mahimkar M. Polymorphisms in tobacco metabolism and DNA repair genes modulate oral precancer and cancer risk. Oral Oncol. 2011;47:866-72. 81. Chuang S, Agudo A, Ahrens W, Anantharaman D, Benhamou S, Boccia S, et al. Sequence variants and the risk of head and neck cancer: pooled analysis in the INHANCE consortium. Frontiers in Oncology Cancer Epidemiology and Prevention 2011;1:13. 82. Varela-Lema L, Taioli E, Ruano-Ravina A, Barros-Dios JM, Anantharaman D, Benhamou S, et al. Meta-analysis and pooled analysis of GSTM1 and CYP1A1 polymorphisms and oral and pharyngeal cancers: A HuGE-GSEC review. Genet Med 2008;10:369-84.